Normally each summer, we try to take a two week vacation to somewhere new and exciting. But with Jennifer’s new job, we had to limit ourselves to only one week; so we hit up the old faithful Smokey Mountains for a week crammed full of whitewater. This is also our first family vacation without Trevor. He decided to stay home and earn a little more money toward a new car. Most of you reading, probably know by know that my itineraries are pretty rock solid and this trip was no different. We headed out from Florida a little later than planned early Sunday morning, due to an alarm clock “issue”. This was Sophie’s (our LhasaPoo) first trip/vacation, so we packed lunches to eat roadside on the way up (with Georgia’s gnats). 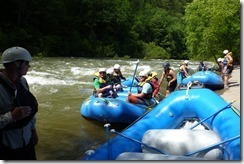 Our activities kicked off the next day, with a rafting trip on the Middle Ocoee thanks to Groupon. This was my fifth or sixth time on this portion of the river, but Jennifer and Brandon’s first. 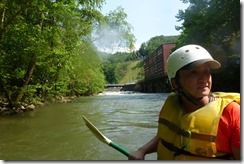 Of all of the people in our family, Jennifer is the whitewater-fanatic. The can’t honestly get enough. This is a far cry from a few year ago, when she was completely afraid of it, and the Middle Ocoee especially. We kept with the King tradition of no one falling out of the boat. The only drama was the horsefly that bit my right wrist and the family of three we shared the boat with. 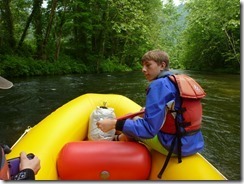 Their 14 year old son, was reluctant to raft at all and this became more and more “apparent” as the trip went on. After the river, we hit up Family Dollar for an overdose of Benadryl for me, then dinner at El Rio in Copperhill. 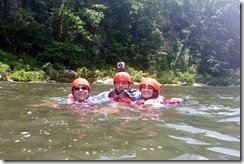 On Tuesday, we met Jennifer’s sister and her kids at Deep Creek in Bryson city. This place is probably the most cost effective activity in the entire area; cheap tube rentals ($3) and free admission to the park. The first time down the tube run, I made the mistake of wearing my flipflops instead of my Tevas. I flipped over on the 1st waterfall and lost my shoe, dragged my camera across the rocks and banged up my knee. I proceeded to fight my way down, until about 10 minutes later a little girl shows up with my shoe. We all headed back to the cabin after tubing for some dinner, before Linda and her Family left for the drive back to Atlanta. 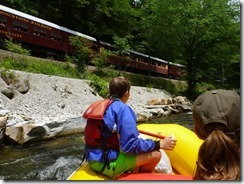 The Nantahala was our adventure for Wednesday. 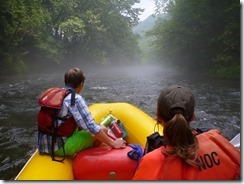 Instead of a guided trip, we rented a raft and guided ourselves. We packed a lunch of hummus and crackers for a riverside picnic. 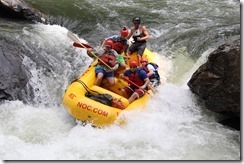 For those of you that have rafted, you know that the Nantahala is an easy river, class I and II for all but the last rapid. Despite this, Brandon fell out. There is one rapid on the river that is repeatable, if you paddle back in from the eddy on river left. We went through the first time, paddled around hard and out he went. I don’t think I’ve ever seen fear like that in his eyes before….it was AWESOME! Mid river we passed an older couple dragging their boat up a 30 foot incline toward the road. Apparently they flipped and totally chickened out. 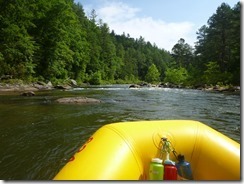 Late in the vacation planning, Jennifer said she wanted to raft the Chattooga, and today was the day. After a quick breakfast, we headed out for our long drive to the NOC outpost in South Carolina. We pushed off from the bank and headed under the bridge, which was our last view of civilization until the end of the trip. 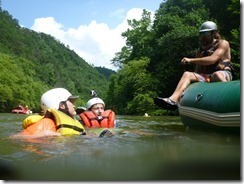 Also the rangers enforce strict rafting schedules, so that no rafting company ever sees another. This coupled with the fact that the river is a completely protected from development make this trip truly unique for the Southeast. Our guide, was sure to point out all of the filming locations used in the movie Deliverance as well as the natural and historical aspects of the river. During the trip, we stopped for short hikes to waterfalls, jump off of rocks, and for a riverside deli lunch. The trip ends with a bang with multiple class V rapids. Two of which we had to portage over, one because of hydraulic danger and the other because of an active recovery being accomplished. Apparently a middle aged man from Tampa drowned in the rapid a few days before our arrival. There were divers and teams using sonar and cameras to try and locate the body. I just learned that the body was finally recovered a few days before I wrote this. It had been trapped in the rapid for 17 days. On the way back to Murphy, we stopped a Rib Country in Blairsville for some BBQ. If you have not yet tried Rib Country’s baby backs, do so. They are the best I’ve ever had. There are locations all over the area. Friday was left open on our itinerary as a “just in case” day. Brandon and I were going to head back to the Nantahala to rent duckies, but my hands were still extremely sore from Thursday on that Chattooga. We opted to poke around downtown Murphy and stop in at the highly recommended (online) ShoeBooties Café for lunch. We made plans that night to head down to the Drive-In in Blue ridge to see a movie, but once we got there, the rain started. 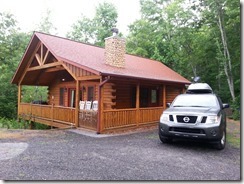 Instead we ate dinner at Pete’s Place, which was recommended by a local then head back to the cabin and rent a movie. 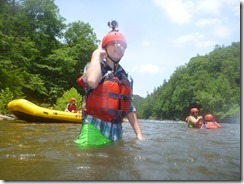 Our last full day in Murphy and our last whitewater excursion; the upper Ocoee. 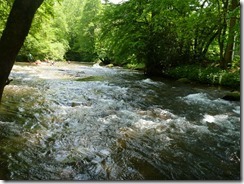 This section of the river, like the Chattooga was a first for all of us. It starts out a little slow, but the whitewater through the Olympic section is probably the best we’ve ever been in. It was a blast, and a great way to wrap up our week. Headed out early for our drive back to Florida. We stopped and picked up subs and had another picnic lunch, this time at the Florida welcome center on I-75. We also detoured slightly to shop at Trader Joe’s in Gainesville before heading home. Sometimes I wonder if we can fit in the amount of activities that we plan into our vacations. But more often than not it works out perfectly. While this vacation was not a grand adventure to some new, exotic location, we all had a blast. At times, we would catch ourselves waiting for Trevor to walk up to our picnic table or be sitting behind us in the raft, he wasn’t, but he was truly missed. 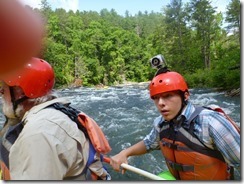 Next time I’m on the Ocoee, I want to be in a kayak! 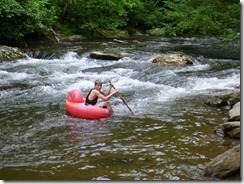 Raft the Chattooga – We’ve rafted in the East and the West and nothing compared to the West until the Chattooga. Desolate, adventurous, waterfalls, hiking, and more. 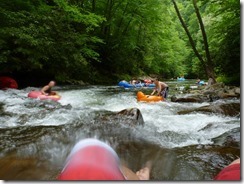 If you never get out to the Colorado/Green/Yampa, the Chattooga is a must. 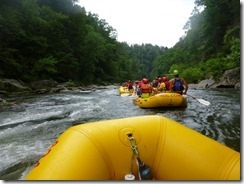 1/2 Price Raft Rental on Nantahala – If you use NOC for a guided trip, you can get a subsequent raft rental on the Nantahala for 1/2 price. Use the Daily Deal Sites – When planning your vacation take advantage of the local deal sites (Groupon, Living Social). 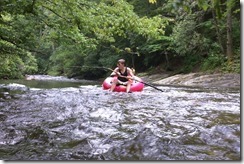 You can often pick up Ocoee trips for $25 or less. 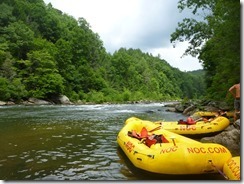 Morning/Afternoon on Upper Ocoee – There is a substantial discount (with Wildwater) by going on the first or last trip of the day. Don’t Bother with Restaurants.com – There are really no participating restaurants in the area. Get Lodging Close to 64/74 – We’ve stayed in Murphy before and were miles from this main drag and it added hours to our overall “time-in-car”. Stay within a couple miles of 64/74. Our cabin this time was one mile away, which was perfect.